Gov. Chris Christie during a bill signing at the White House on Tuesday, when he had lunch with President Trump amid talk of a possible job. On Tuesday, Gov. Chris Christie of New Jersey had a meatloaf lunch with President Trump at the White House amid talk, once again, that he was on his way to a job in Washington. By Thursday, though, Mr. Christie was on the menu of a municipal court in Fort Lee, N.J., where a citizen had lodged a criminal complaint against him over the George Washington Bridge lane-closing affair and a judge ruled that the case could proceed. Perhaps other events this week overshadowed the president’s meal with Mr. Christie, and the already thoroughly chewed-over political scandal of the traffic jams. Just since Sunday, the president’s national security adviser resigned a) voluntarily, although he enjoyed the president’s “full confidence,” as the White House said on Monday; or b) under pressure, as the White House said on Tuesday; or c) because he was fired, as the president said on Thursday. The nominee for labor secretary withdrew from consideration as the bottom was falling out for him politically. And a confidant of the president went almost straight from a meeting with Mr. Trump at Mar-a-Lago to a television interview where he said that the White House chief of staff wasn’t up to par. “This is a fine-tuned machine,” Mr. Trump said on Thursday. The renaissance of Mr. Christie within the fine-tuned machinery of the Trump White House should not go unremarked. Both men have achieved record-setting unpopularity levels in polls. Still, the governor’s devotion to the president, which has been publicly and sorely tested, remains unwavering. Mr. Christie was the first prominent Republican to endorse Mr. Trump during the primary campaign and he pushed reluctant donors to support Mr. Trump. Last summer, he lobbied hard to be Mr. Trump’s running mate. Believing he had been offered the spot by Mr. Trump, he wound up being jilted at the last minute. 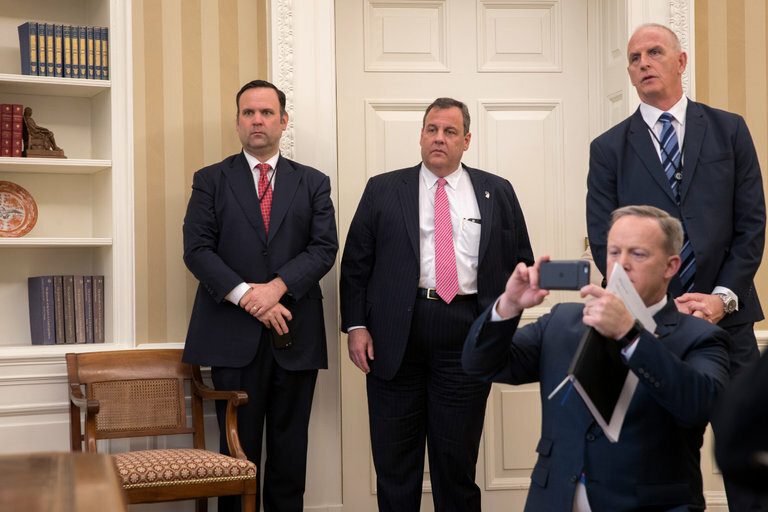 Nevertheless, Mr. Christie soldiered on through the campaign, bearing the title of director of transition for Mr. Trump at a point when the need for such a job seemed far-fetched. Still, Mr. Christie diligently planned. Three days after the election, he was summarily fired from the transition. Anyone associated with him was purged. Nor was he offered any of the cabinet jobs, such as attorney general, that he openly pined for. Yet here were Mr. Trump and Mr. Christie on Tuesday, dining like old pals. The governor later revealed that after the president said Mr. Christie could order whatever he liked, Mr. Trump insisted that they both have meatloaf. It is evident that Mr. Christie would eat whatever was put in front of him. Just three weeks ago, a weight seemed to have been lifted from him when the Bergen County prosecutor said Mr. Christie would not be prosecuted on a citizen’s complaint that the governor did nothing to stop the traffic jams that his aides had maliciously created at the George Washington Bridge. Before the actual lunch, news of the Trump-Christie date was passed around in New Jersey political circles, where Mr. Christie had been treated as a forlorn figure, a tiger with no teeth, tormented by politicians he had once bossed around. Afterward, the official word was that they talked about how to fight opioid addiction, and Mr. Christie’s possible role in a federal effort. But the clear message was that Mr. Christie was welcome within the Trump White House, at least within the finely tuned part controlled by the president. If Mr. Christie really is in line for a job in the Trump White House, he might find the president sympathetic to gripes about judges. At his news conference on Thursday, Mr. Trump spoke about the executive order limiting entry from seven predominantly Muslim countries into the United States, which also froze travel by tens of thousands of people with green cards and other visas. Politicians in all parties said the order had been unnecessarily disruptive. Federal courts have suspended the order to hear challenges. Mr. Trump wasn’t having it. “The rollout was perfect,” he said. Maybe at their next lunch, bad, nonsensical judges will be on the menu.